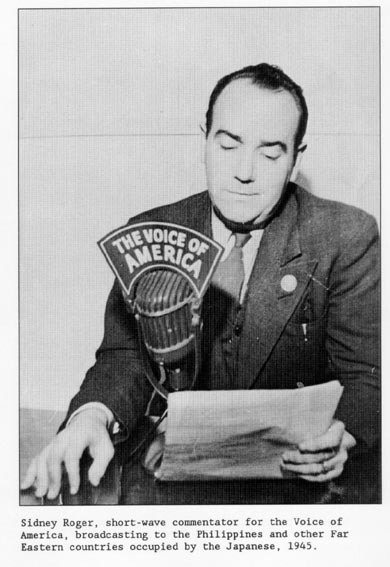 While both the Bay Area Council Against Discrimination (BACAD) and the Fellowship Church contributed to an independent, cosmopolitan, left intellectual climate in 1940s San Francisco, perhaps the most authoritative local voice to adopt anti-fascist and anti-imperialist war aims as part of a popular, internationalist mission was that of radio and print journalist Sidney Roger. 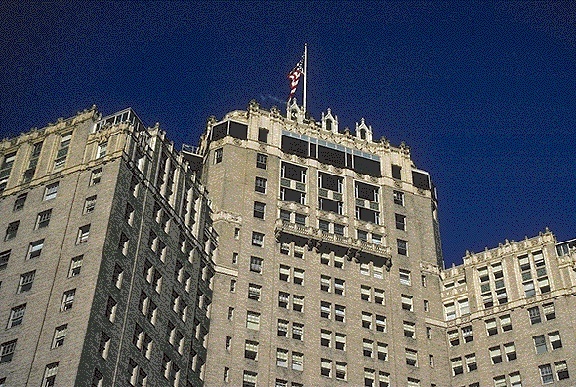 The Mark Hopkins Hotel on Nob Hill, mid-1990s. Motivated by his own principles, but also carefully playing upon Americans’ impulse to distinguish themselves morally from the Japanese enemy, he warned that “the poverty of real democracy” in the current Allied plan for colonial areas appeared “quite shabby” as depicted on Japanese radio. 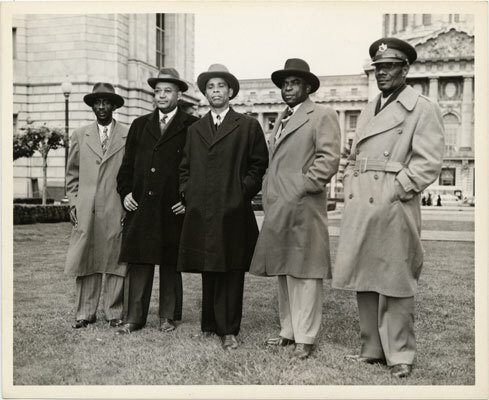 UN Conference 1945, Ethiopian delegation at City Hall, San Francisco. 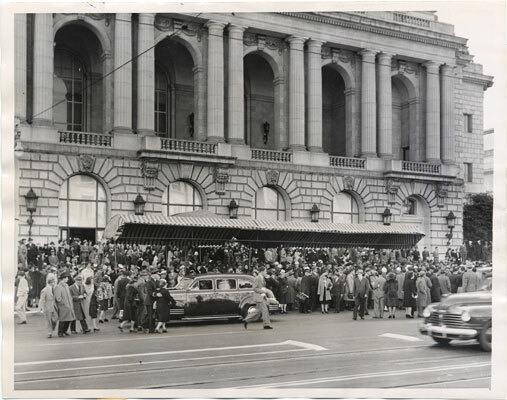 Crowd outside Opera House after first meeting of UN Conference, April 25, 1945. 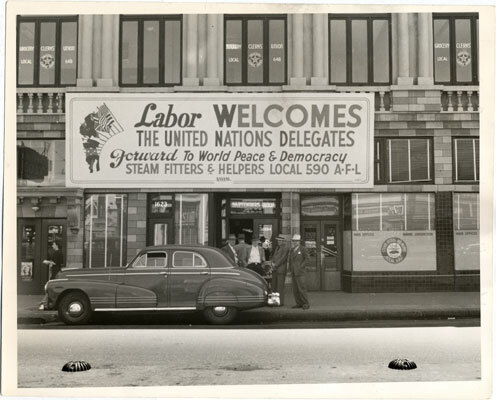 Steamfitters welcome United Nations, 1945. Roger’s blending of world anti-fascism, anti-colonialism and working class solidarity would continue in the years that followed, marking a rich but challenging career during the McCarthyist period and beyond. (26) Roger’s philosophy—like that of BACAD, the Fellowship Church, and other California internationalists—is a good example of the kind of left internationalist thinking that found a particularly receptive environment in California in the 1930s and 1940s. This was the intellectual climate of the Bay Area in which world leaders gathered in 1945. 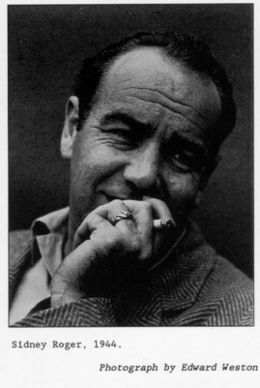 And, significantly, it was also the climate in which two significant workplace confrontations occurred, ones that brought into sharp focus the contradictions raised by Roger in his call for ethno-racial democracy : the shipyard civil rights fight and the machinists' dispute with the War Labor Board. 10. “Tokyo Inside Out,” San Francisco Chronicle, April 30, 1945 p9 and May 21, 1945 p5; Although Roger clearly expresses his internationalism and anti-racism in numerous instances, his Chronicle articles do include the contemporary epithet for Japanese people during the war. His usage seems to be confined to descriptions of the Japanese government. I found no evidence in the materials on Roger of any condemnations of Japanese people in racial terms. 15. “Interview with Filipino guerrillas”. Cassette in Sidney Roger Collection, Labor Archives and Research Center, San Francisco State University. [Hereafter LARC, SFSU] This interview is also recalled in Roger, A Liberal Journalist p78, p141 and p188-189. 23. October 3, 1946 transcript, ibid; March 18, 1946 radio script, ibid.